Below is the first long post I sent to Kewl Steve's Doo Wop Shop messageboard on 19th September 2000. Maybe I should have put this in the introduction to this blog, as it still spells out how I feel about doo wop today. The post doesn't need much contextualising; a debate had been taking place on the board about just what constituted doo wop: Crewcuts vs. Penguins, Gladiolas vs. Diamonds etc. Although I was addressing the board as a whole, this first attempt to articulate the difference between those groups for myself is what triggered the lengthy dialog[ue] with Clarke, so this is really where that correspondence begins. The last preserved post, incidentally, is dated 1st October 2000 - so the ninety-plus pages of printouts which will eventually all be posted here under the heading of Doo Wop Dialog[ue] were the result of less than a fortnight's fevered activity. Doowop is (or let's say tends to be) music sung by a quartet or quintet, often male, where the instrumentation, if any, is essentially secondary to the interplay of voices, and is fairly rudimentary: accentuating a beat or subtly enhancing the overall tone, not vying with the vocal display for attention. 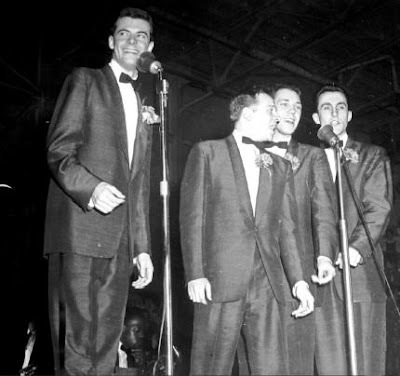 The voices may be said to mimic instruments - the bass voice can perform a similar function to a double bass, or think of the late Gerald Gregory's great bass saxophone-like intro to Goodnight Sweetheart, Goodnight - and there's also that trumpet-like sound that Phil Groia termed the "blow harmonies" of the Moonglows. Sophisticated as these groups are, the appeal is of something homemade, within the reach of everyone: "Music you or your lover could have made," as a Rolling Stone essay said of Earth angel (Penguins version!). For my money, once vocal group records became productions - ie, once the voices became part of the overall effect rather than the primary focus - they stopped being pure doowop. The Drifters' There Goes My Baby is a great record but the kettledrums and strings mean we admire the producers as much as the group. I wouldn't be so stupid as to say "That's when the rot set in"; it just became something else. The only trouble is that my definition would include the instrument-emulating Mills Brothers, and I don't think anyone would consider them within the genre. So this brings me to the next, and crucial, part of the definition: the voices must be, to some degree, gospel-inflected. Mills Brothers, Inkspots don't make it; the Ravens and the Orioles, even when singing similar material, do: it's that sense of raggedness, of each performance being alive, new-minted at that moment as opposed to a smooth duplication. With groups like the Crewcuts I'm reluctant to impose a blanket ban, but they do seem a long way from gospel: the feel matters less than a surface brightness and smoothness, whereas group like the Capris somehow seem to have a sense of flexibility in their performance that (again) has affinities with gospel, even though it's a long way from the raunchinesss of some groups. But I freely admit that there is a grey area that is down to the listener's subjective impression: I don't much like the Platters but presumably they come from that gospel root, antiseptic as their performances seem to me. Perhaps the best I can say is that the doowop performances which move me display their church roots more prominently. Finally, on to the Diamonds/Gladiolas debate. Dave Marsh in The Heart of Rock and Soul (1000 records assessed, inc. lots of doowop) says that groups like the Diamonds were basically responding to the institutionalised bigotry of a market which wanted "more acceptable" versions of black hits. And apparently this college-educated group viewed R&B with "dripping sophomoric contempt." (Marsh is a fun read!) But he admits their version is nevertheless "as exciting as it is insincere": "When the thrill's the thing who gives a &*%! about intentions?" Whew! What a long posting! Thanks if you've stayed with it - and hope my tentative attempt at defining, for myself, this genre we all love is of use to others. I'm resisting the temptation to expand or revise the original Doo Wop Shop posts. It seems to make more sense to add notes at the end, which also has the fun effect - for me, anyway - of making this blog more than a storeroom. So I didn't add, when talking about the Inkspots, the sentence which would have summed it up: as far as I'm concerned doowop is essentially the difference between that group's rendition of When the Swallows Come Back to Capistrano and the Dominoes' recording with Clyde McPhatter. And if nothing else I'm consistent, as this 2007 review of a Mills Brothers collection shows. 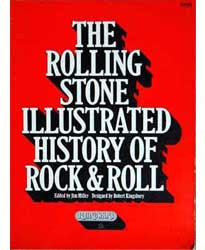 The Rolling Stone essay came from their Illustrated History of Rock'n'Roll, I presume the first edition, which had wonderful large format pictures. That had a big effect on me in the late seventies, devouring the essays about doo wop and the list of recommended recordings. 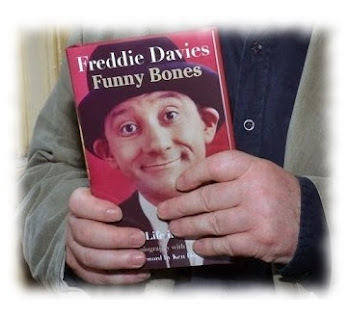 There was also a wonderful picture of Gerry Marsden (of Gerry and the Pacemakers fame), grinning from ear to ear; a later edition of the book seemed to have scaled down that photo, or maybe the whole book was smaller format, or maybe the British invasion was too terrible a memory, after all. Anyway, that began my formal education in doo wop, and I don't have a copy to thank the author of that doo wop essay. But what a wonderful phrase, which helps explain the music's appeal: however strange it seems, it's also within reach: "music you or your lover could have made." One of the Diamonds is a prominent interviewee in a fairly good, but annoying brief, documentary about doo wop available on DVD, Life Could Be a Dream: the Doo Wop Sound. I've reviewed it on a certain well known shopping website and will probably reproduce it here, but I have to say that, intelligent and articulate as he seemed, it just felt wrong to have him there, especially with Dave Marsh's phrase echoing in my head: "sophomoric contempt ... sophomoric contempt..." In my review, I've convinced myself that a brief bit of archive footage provides damning evidence he and the other Diamonds aren't taking the genre seriously, but who knows? And re Clyde McPhatter recording When the Swallows Come Back to Capistrano, there's a story which I read in Bill Miller's book on the Drifters which says that McPhatter, leaned upon to sing it "properly," blurted out that this was the only way he could sing it. There you have it; that's doo wop. Compulsion before craft.